Windmill Brae is one of those spots in Aberdeen where the past and present collide. It’s a cobbled wynd that speaks of the city centre’s older past of higgledy-piggedly streets, steeped in history. Yet it is also firmly fixed in some people’s minds as late night party central. On the night we ventured down it was more olde worlde – buildings lowering over a quiet street. And that stepping out of place and time theme continued as we crossed the threshold of Cafe Boheme. Warm and welcoming, all wooden beams and panels, brick arches, gleaming glasses and a roaring fire, it was like walking into a traditional Parisian cafe. One that oozed French chic to match its cuisine. Our welcome was equal to the warmth and charm of the decor as we were seated next to the fireplace and made to feel as welcome as old friends, even though we had never been there before. Our mission on the night we visited Cafe Boheme was straightforward. Check out its menu for Aberdeen Restaurant Week. And what a menu it is… both in terms of choice and price. 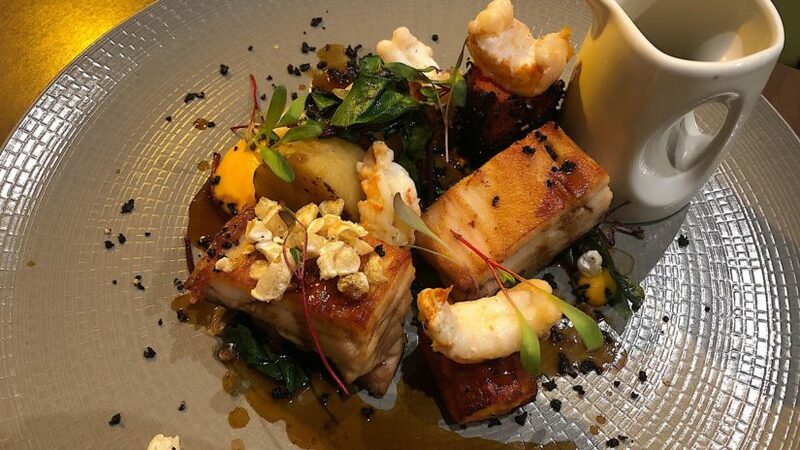 One course for £13, two for £17 and three for £20. What’s not to like. The choice is just as attractive, with four starters, four mains and four desserts. Not that we hummed and hawed at all. 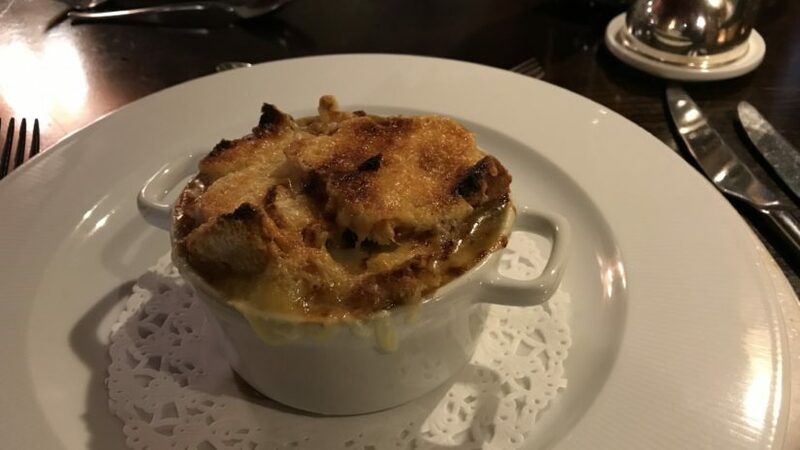 My other half has a passion for French onion soup. While mussels are always my go to starter. Settling back with a Biere Maison (brewed by Stonehaven’s own Six Degrees North) for me and a glass of water for the designated driver, we just soaked in the busy atmosphere of happy diners before our first course arrived. My mussels turned up in a bowl brimming with shellfish. All of them were open and held deliciously plump Scottish mussels. 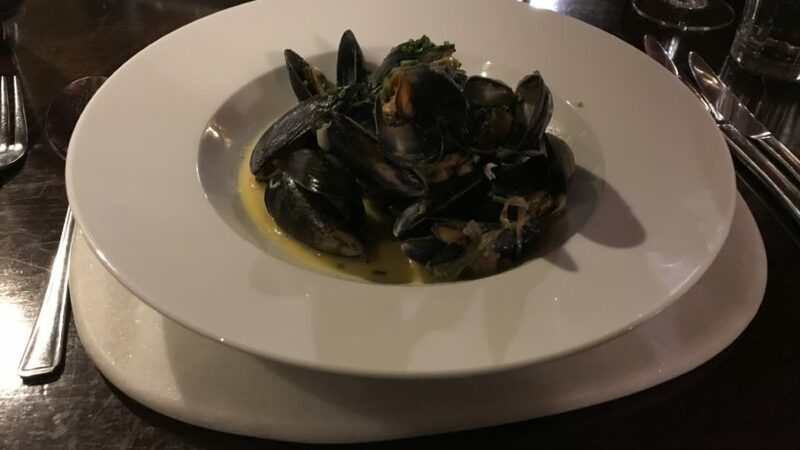 Adding to their delicate flavour was the amazing broth which resulted from steaming the mussels in Normandy cider and a pancetta cream. Often the liquor is a bit of an afterthought, something salty to dab at with a bit of crusty bread. Not so here. This was a proper broth, sweet from the cider, salty from the pancetta, rich and creamy in its own right that demanded to be finished off. So I obliged. Meanwhile, on the other side of the table my missus was getting stuck into what she called “a little pot of comfort”. Grilled Gruyere layered over toasted bread topped off a bowl full of steaming, delightful soup. The salty cheese was a marriage made in heaven with the sweet onion. This was just the thing for a cold winter night, whether in Aberdeen or Paris. Starters done, we sat back and raised the obvious question. Why hadn’t we been to Cafe Boheme before? The mains were on their way, so I stepped up from my rather nice beer to a really fine glass of the house red, a terre des olivettes rouge. 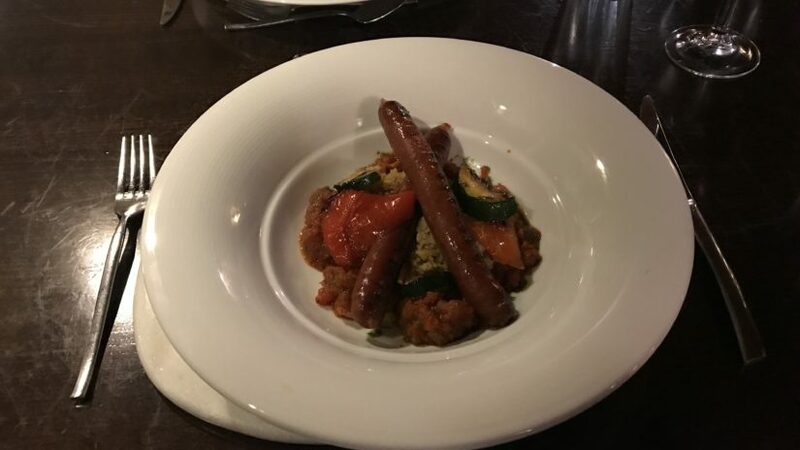 It went perfectly with my choice of merguez sausage with its apricot and coriander cous cous and harissa dressing. We were back to that “comfort” word again. This was like a Med version of sausage and mash. Of course, the sausage in this case was spicy, meaty and flavoured through with cumin. Once you slathered it in the chili-laden harissa paste, you had a tongue-tingling delight. Balancing this was the cous cous, light and fluffy with excellent roasted veg and the sweetness of apricot with the freshness of coriander. All the elements combined made for a plate of food you slowed down on because you didn’t want it to end. Hearty fayre was happening across the table again, with my wife’s pork blanquette. 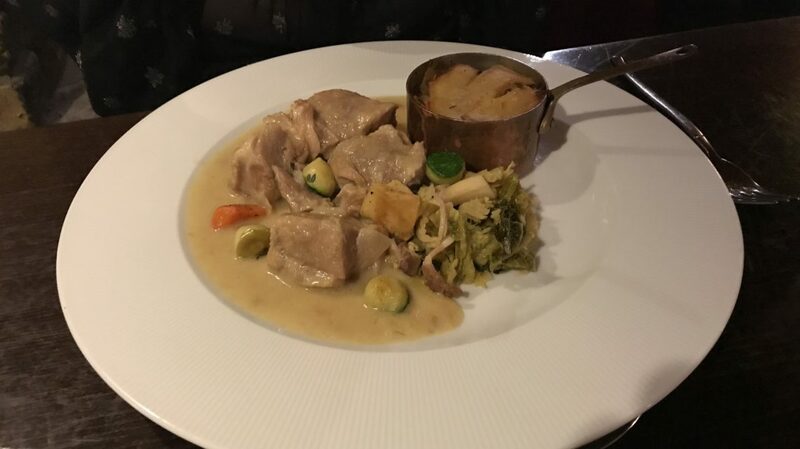 Who knew that those two little worlds would lead to a rich stew of tender pork shoulder, slow-cooked lovingly with Normandy cider, pork stock and vegetables including sweet onions and little studs of courgette. It came with a wee brass pot of super tasty boulangere potatoes. It was classic French, a rollercoaster of flavours that made you go “mmmm”. All in all, a cosy blanket against the cold. Maybe that’s where the name comes from. By now we were both getting on for full, but had that warm glow about us that comes from eating well. There was, though, the small matter of dessert. 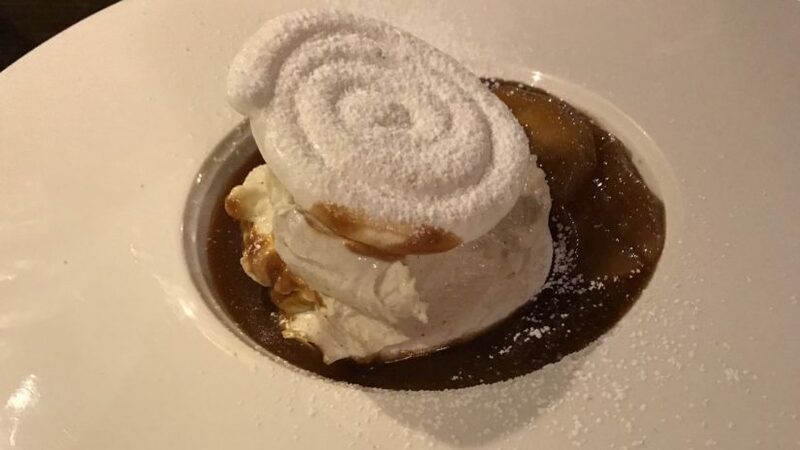 We decided to share the caramelised apple and pear meringue. This was two flat spirals of meringue, holding a thick slab of vanilla mascarpone, with a salted caramel sauce. The crunch of the meringue gave way to a gooey interior which blended sweetly with the mascarpone. 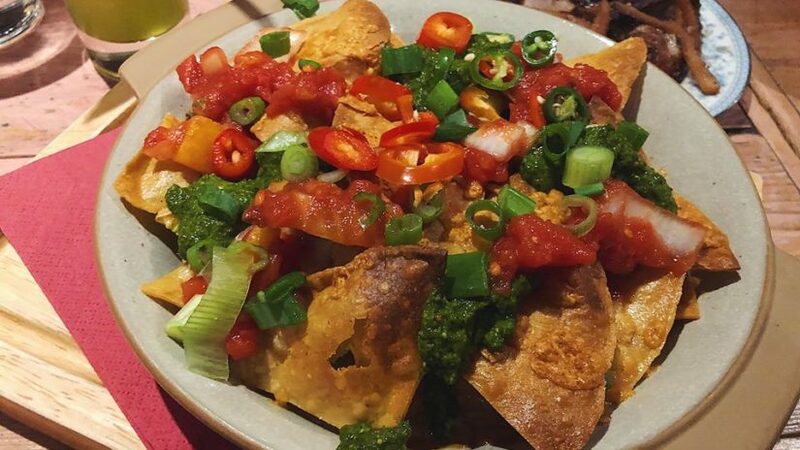 The sauce added both sweetness and saltiness. It was the perfect end to a perfect meal. Our visit to Cafe Boheme underlined why Aberdeen Restaurant Week is a good and important thing. It took us into a restaurant we had never tried before, drawn by a menu priced just right. Not only did we discover a delightful spot with outstanding food, we might have just found one of new favourite places to eat. 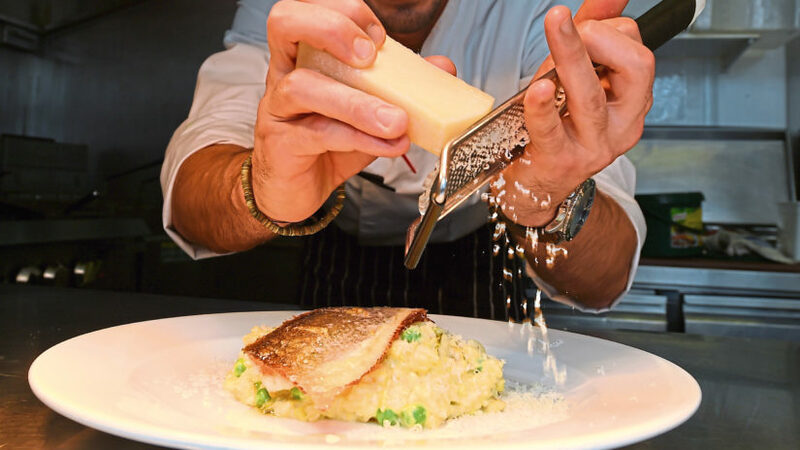 Price: One course for £13, two for £17 and three for £20.